My Christmas holiday traditions keep evolving over the years and reflect changes in my life, but the joy and celebration that I love are constant. 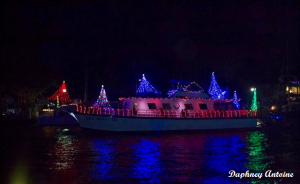 The latest tradition to be added at the holiday season is watching the parade of festively lit and decorated boats on the Intracoastal here in Florida. These famous parades occur all along the Intracoastal Waterway. I instituted my event—a gathering of friends to enjoy the local parade—when I moved into a condominium with a magnificent view of the Intracoastal below. I decided this was too good not to share with friends, so each year I invite them to watch the spectacle from my balcony. And a spectacle it is. 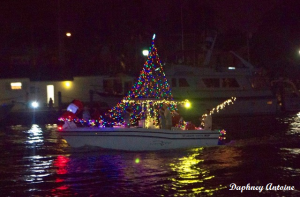 Boats of all sizes decorated with lights glide along the Intracoastal. The owners’ enthusiasm for and pride in their floating light shows is evident! No two are alike. Some boats display lights of one color—dramatic, to be sure. 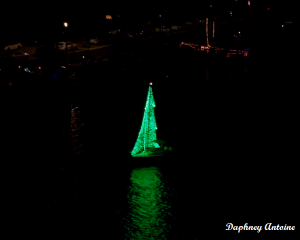 But most have a mix of colors, and these pinpoints of light outline the boats’ features. Masts, poles, the bow, railings, even the lifeboats on the bigger yachts, are outlined in lights. Of course, there are parties on these boats. People wave to each other in good cheer, toasting the season, friendship—and the warm weather, certainly, as many of these people are snowbirds taking refuge for the winter months in sunny Florida. My party begins after a gorgeous sunset which I can see from my condo. The sky is dark. The ocean is invisible at night except for the distant lights of occasional ships beyond the coastline. But from my windows, my guests and I witness a riot of colored lights breaking up the darkness. I open the balcony doors to hear the music from the boats. 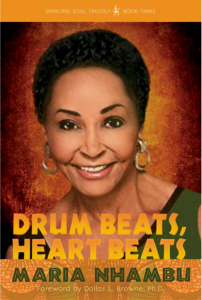 It blends in a tantalizing way with my African Christmas music, perhaps the Missa Luba sung by a choir from the Democratic Republic of Congo, or songs by Miriam Makeba and other musicians whose work I use in my Aerobics With Soul® African dance workouts. Some of my guests are my neighbors whom I’ve gotten to know through teaching Aerobics With Soul® here at the condominium. Others are friends I’ve made since moving to Florida. And some come from a distance to share in the fun. Because I am a “bridge” person as a biracial woman, I have a mixture of people at my parties. I love seeing my friends from every race and all walks of life mingle and enjoy each other in the spirit of the season. In the U.S., I found that people don’t often have the opportunity to socialize and mix with others outside their customary groups. But at my parties, we enjoy and celebrate our diversity! For me, it’s all about the real spirit of Christmas that I experienced so profoundly growing up in the orphanage in Tanzania. It’s about light, love, and joy permeating the darkness and filling all our hearts. With love to you this Christmas season and best wishes as you enjoy and make your own holiday traditions. And although we may be geographically prevented from attending special parties on the Intracoastal Waterway, we will always think of you as a member of our Norwegian tribe. Yes, you are truly a bridge person! What an appropriate title, bridge person! You truly bridge people from all over the globe. I can attest that your boat parade parties are so much fun, no one wants to go home! Sounds wonderful and I liked the idea of having a lot of diversity and everyone getting along, enjoying the same thing. Merry Christmas! How beautiful. 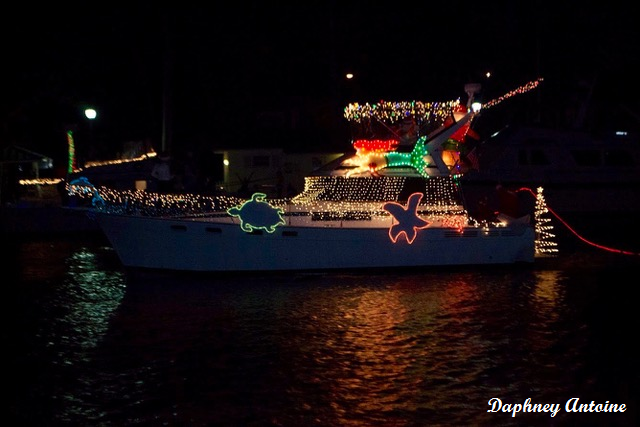 Christmas is such a wonderful time of the year and being former boat owners would love to view the parade of boats. How loving and thoughtful of you to share with friends.